I'm not a Democrat—in case you haven't noticed—but Howard Schultz is. And Schultz isn't one of those Blue Dog, Southern or Midwestern, conservative Democrats either. He's from Seattle, holds liberal positions on, as far as I can tell, every issue, and has donated gobs of money to the Democratic Party and to the last two Democratic presidents. 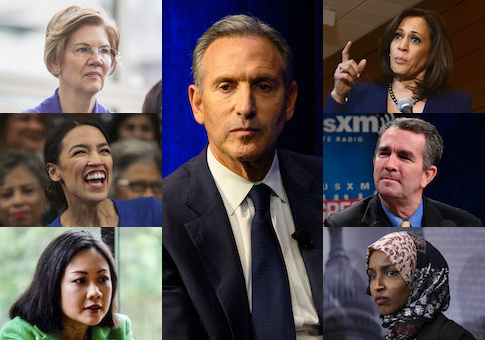 But Schultz is also a democratic capitalist who attributes his phenomenal success—his fortune from Starbucks is around $3 billion—at least in part to America's culture of entrepreneurial risk-taking, minimal government interference in commerce, individual responsibility, and rule of law. He worries that the Democratic Party, radicalized by the presidency of Donald Trump, is in the process of abandoning support for the very aspects of American life that made his life possible. "Both parties are consistently not doing what's necessary on behalf of the American people and are engaged, every single day, in revenge politics," Schultz told 60 Minutes last Sunday. The Democrats then began proving his point for him. On Monday, in a townhall organized by CNN, Kamala Harris endorsed a Medicare-for-All plan that would "eliminate"—her word—private insurance. According to the Kaiser Family Foundation, employer-provided health insurance covers "approximately 152 million nonelderly people in total." A poll last year by America's Health Insurance Plan (AHIP) found that 71 percent of Americans were satisfied with their employer's plan. Most Americans have health insurance, and most Americans are pretty happy with their insurance. Too bad: Kamala Harris says it's time to "move on." Harris's rival, Elizabeth Warren, has endorsed a tax of 2 percent on assets above $50 million and 3 percent on assets above $1 billion. Now, Warren would like to raise taxes on incomes, capital gains, dividends, and corporations, too. That's just for starters. A wealth tax of the sort she has proposed—a government claw-back of property in order to make real a subjective standard of equality—would be unique in American history. It might even be unconstitutional. But hey, why worry about that when you can indulge in some light court packing? The brightest star in the Democratic Party is Alexandria Ocasio-Cortez, aka AOC. The other week, in conversation with Ta-Nehisi Coates, AOC said, "I do think that a system that allows billionaires to exist when there are parts of Alabama where people are still getting ringworm because they don't have access to public health is wrong." Don't worry, "It's not to say someone like Bill Gates or Warren Buffet are immoral people." AOC's complaint is with the "system" that "allows" Gates and Buffet—and Schultz and Bezos and George Lucas and Mark Zuckerberg and the rest—"to exist." Presumably, then, Gates and Buffet are safe, existentially speaking. But the "system" of relatively free enterprise that allowed them to grow rich—and finance or innovate remarkable advances in technology and productivity that have benefited the world—should be altered drastically. Hence AOC's call for a 70-percent marginal tax rate—backed by the same genius from Berkeley who designed Warren's expropriation of wealth—to help pay for the "Green New Deal" that will give us "a 100% greenhouse gas neutral power generation system, decarbonizing industry and agriculture and more." Currently, 17 percent of American energy is renewable. The scale of coercion required for such a transformation would brighten any Jacobin's day. Don't think too hard about the details of the proposal, though. AOC says there isn't time to worry about cost, implementation, and unanticipated consequences. "The world is going to end in 12 years if we don't address climate change," she told Coates. Nice while it lasted, I suppose. AOC also has a message for Schultz, who has been the recipient of sustained, ferocious, and panicked attacks from members of his former party outraged that a moderate billionaire might spoil their plans for replacing Trump with an unreconstructed left-winger. "Why don't people ever tell billionaires who want to run for president that they need to ‘work their way up' or that ‘maybe they should start with city council first'? " she Tweeted. Well, plenty of people do tell them that—I seem to recall a lack of government experience being an issue in the most recent presidential election—but if anyone has "worked his way up," from the poorhouse to being the first in his family to graduate from college to turning a coffee shop at the Pike Place market into the global behemoth that is Starbucks, it's Howard Schultz. I'd even go as far to say that Schultz's company has done more for its low-wage workers than the corniest socialist dreams of AOC. Let's see … what else happened in the busy world of crazy … excuse me while I flip through my files … Ah yes, there was congresswoman Ilhan Omar, parroting the Kremlin-Havana-Tehran line on the democratic uprising in Venezuela, calling it "a U.S. backed coup." A few days later, Omar, a supporter of the anti-Semitic Boycott Divestment Sanctions movement whom the Democrats have awarded with a place on the House Foreign Relations Committee, said she "almost chuckles" because "we still uphold" the Jewish State of Israel "as a democracy in the Middle East." I chuckle—and begin seriously to worry—that someone who cannot distinguish between tyranny in Latin America and democracy in the Middle East commands such acclaim and receives such attention. Omar has former Obama adviser Valerie Jarrett in her corner. When Omar dismissed Congressman Lee Zeldin's criticism of her views by Tweeting, "Don't mind him, he is just waking up to the reality of having Muslim women as colleagues who know how to stand up to bullies! ", Jarrett replied, "Shake him up!" Zeldin is a Jewish Republican. Finally, as the week came to a close, the Democrats went beyond their support for partial-birth abortion to defend—the very fact that I have to write the following words saddens me to no end—post-birth abortion. This practice has been known throughout history as infanticide, and it flourished widely in the ancient world before being condemned in the Judeo-Christian tradition. As we "progress" from that tradition—a progression that is in fact a reversion—the morals and values that bind us to a culture of life slowly fade away. They are still there, of course, gossamer-like and tenuous, which is why Kathy Tran, the Fairfax County delegate to the Virginia Assembly who sponsored a bill lifting all state restrictions on abortion, hesitated before admitting that her legislation authorized the termination of a pregnancy up to the moment of delivery. If a mother is in labor, I can tell you exactly what would happen. The infant would be delivered. The infant would be comfortable. The infant would be resuscitated if that's what the mother and the family desired, and then a discussion would ensue between the physicians and the mother. Note the sequence of events. The "infant would be comfortable," Northam says, and then "a discussion would ensue." A discussion about what? The Boston Red Sox? Or would it be about the fate of the child—the life or death of a born-alive child? Who would want to be part of such a discussion? Who can contemplate such an exchange without becoming queasy? This entry was posted in Columns and tagged Howard Schultz. Bookmark the permalink.